When the opening scene of a movie shows a woman, Maggie, staring at a handful of medication, obviously wanting out of her life, only to receive a phone call that her brother Milo has just attempted the same act, but is alive, in hospital… One can’t help but be immediately intrigued. Considering this concept is thrown at you in the opening scenes, it is hard to not be drawn into this world suddenly presented before us, as we can only wonder what will follow this introduction; presented in less than five minutes! While the obvious and dark theme that permeates this story is suicide, the movie has a big heart while thoroughly exploring the premise and the dark, yet numerous reasons why someone would want to take their own life. 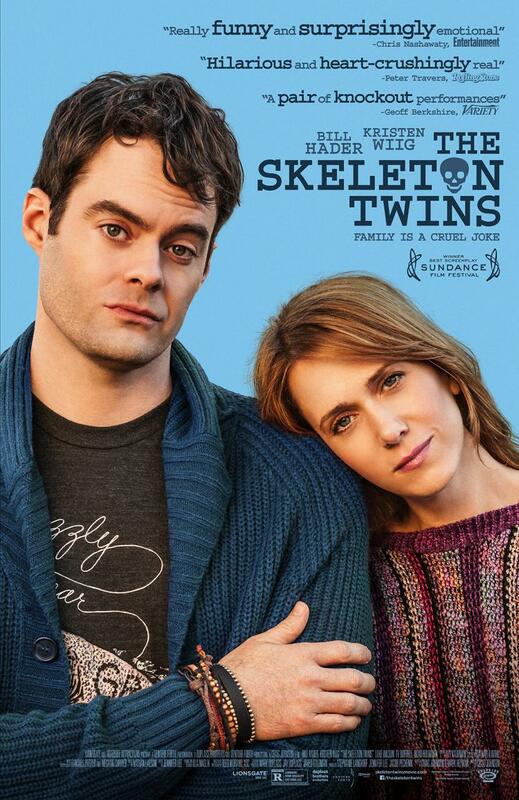 With some black, Coen-like subtle humour to also lighten the mood, The Skeleton Twins also examines family relationships, both between siblings and their parents; the movie focusing on the former, following the reunited siblings through their personal ups and downs, their potentially life-changing dramas as well as their trivial disputes. They have, after all, reconnected after ten years of no contact – which unfortunately is not an uncommon path for some siblings to follow. Additionally, this is not a simple movie in regards to the concepts it explores, but it isn’t hard to follow in any sense either. It simply studies many of the darker, personal aspects of the human condition that can relate to mental illnesses or worse, simultaneously, and with skill I must add. Being Australian, and without any TV, it almost goes without saying that the two leads here, Kristen Wiig and Bill Hader, were completely alien to me, which, now that I think about it, most probably helped in immersing me into this world. A little reading though and I was surprised to find out that both actors were a part of the US television institution Saturday Night Live. I guess then that it isn’t so surprising to find out that Bill Hader has been involved in several comedies, as has Kristen Wiig, though I don’t recall having seen either of the movies they each appeared in. To this viewer then, their history was a mystery, which again helped me to enjoy the film just that little bit more. Their chemistry as siblings was incredible and immediately obvious when the film started – I now know the reason for that! Given their history, this movie’s slant towards comedy isn’t surprising, but Knocked Up or Bridesmaids this is most certainly not. While there are many laugh-out-loud moments, they range in tone admirably; challengingly switching tone, from dark humour to charming banter between siblings. Given the overall theme of the movie, I applaud these two young actors for stepping outside their comfort zone to create a compelling drama that has the perfect amount of sentimentality while maintaining a dark, comedic core that is unlike anything either of the two have done previous. As the movie progresses we find out why these siblings both wanted to end their lives. Milo, a gay man in his thirties, has been bullied by the ignorant people of the world, and he seems desperate to rekindle a relationship with their mother, a sentiment that his sister does not share at all, seeing this plot as a hopeless waste of time. Considering the fact that their father died when they were children, a fact revealed at the beginning of the film, one cannot blame this man for wanting to connect with his only living parent. In contrast to Milo, Maggie’s reasons for contemplating suicide are decidedly different. Despite being married to a handsome, nice man filled with personality, she seems intent on attempting to sabotage her own chances of happiness, on many an occasion. Perhaps the fact that her husband is such a happy-go-lucky chap is a factor? Or perhaps not? I cannot claim to read minds, especially those of fictional characters! Regardless of this, both of these characters’ reasons for wanting to leave this world are the key reason to watch this film til its end, as even though they each have their own reasons and thought patterns, their fate as siblings are still intertwined. To lighten the mood, another reason to catch this flick is some wonderfully funny scenes shared between Milo and Maggie as they steadily reconnect further: perhaps the most memorable scene they share is a night out that they spend together, with Bill dressed in 100% drag, which of course does not bother his sister in the slightest; in fact, the outfit was her idea! Milo happily plays along, as we wonder if his failed attempt at suicide has lightened his overall mood? At first, the ending to this film felt very sudden and abrupt. Upon further reflection though, I think it ended on perhaps the perfect note, weaving the film’s many themes together seamlessly. 4/5 – The dark subject matter is handled with ease, as is the humour; timed well and not intrusive, nor overdone. Some elements of the film seemed to meander a bit, resulting in a few unresolved issues, but as for the main themes of this movie, it succeeds. Certainly a great step forward for both actors, as while the film maintained its many comedic elements, at its core was a serious drama, lifting the lid off several issues that many people don’t like, or simply don’t want, to talk about or even explore. For this alone a applaud both the leading actors and director Craig Johnson. This one sounds interesting. I’ll have to check out the UK release date. Wiig seems to have chosen some unusual films lately – it’s great to see her treading a less obvious path. I agree. I had no idea who either actor was, but given their lighter comedic past, this is truly a positive and progressive step forward, firmly outside both of their comfort zones. Despite this departure from their past though, dopn’t be fooled: this movie is extremely funny, just in a much darker fashion compard top their past work.